Key to the Workforce Management module is the Skills Management feature. Here, administrators can assign skills to personnel which will operate as a filter when associated with a service call, project, and/or activity. When a Service Call is created, planners can select a predefined skill from the Skills dropdown, in order to match available technicians to customer requirements. 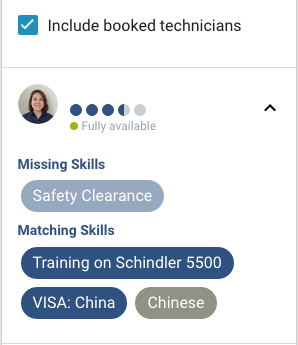 Additionally, you can also use the Find Matching Technician feature in order to see which technicians’ skills match the service call requirements. Name Required. The name of the skill. Description The description of the skill. Though this field is not required, it is recommended, as the description will display as a tool tip when creating technician and service call filters. Technician In the panel to the right, the application will display all technicians currently associated with the selected skill. To add associate additional technicians with the skill, you can search by name in the Technician field. Valid From Optional. The beginning date on which the skill is valid. As skills can also be associated with attributes such as licenses, certifications, visas, etc, this can help ensure that only technicians with valid credentials are assigned to service calls with such requirements. Valid To Optional. The end date on which the skill is valid. As skills can also be associated with attributes such as licenses, certifications, visas, etc, this can help ensure that only technicians with valid credentials are assigned to applicable service calls, and that if the credentials have lapsed and are no longer valid, they won’t receive assignments that require them. Skills generally begin as customer requirements. When a service call comes in with a specific requirement (such as skills, certifications, language abilities, etc) they can then be matched with a corresponding skill. From the Skills tab, you can then create new skills to correspond with customer requirements by adding a name and description of the skill. Skills can then be assigned to technicians by selecting the technicians with the required skills in the technician field of the Skill Details panel. Now, when a service call comes in, you can select the necessary skill from the Skill dropdown. 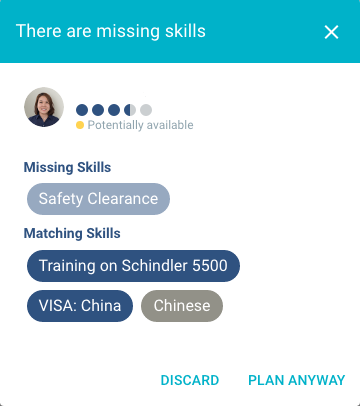 In the Technician Filters section of the Workforce Management module, skills can be combined with other criteria to create powerful filters to improve service call outcomes. When a new service call comes in, you can apply a skills-based filter by selecting the saved filter from the Technician Filters list. Skills are a defining filter for every business. With the Skills Management tab, you can create new skills and associate them with employees. When a service call is created and a skill is selected, this will filter the available employees. Let's say that a new service call has come in. The customer is in Italy, which means that the technician that responds needs to be assigned to the Italian territory, and have the necessary language skills to fulfill the service call. By navigating to the Skills tab, you can create a new skill by adding a name and description. Once a skill has been created, you can then assign them to technicians and employees. After a skill has been created, you can then assign them to technicians that possess these skills. By selecting a skill from the skill list, you can then search for technicians in the technicians search field. By selecting a technician record from the returned records, you are thereby assigning the technician the skills. To delete the technician skills association, simply click the "x" beside the technician name. The Filters feature of the Workforce Management module is used to create and apply filters for both Service Calls and Technicians. Once created, these filters can be used to quickly filter technicians or service calls in order to improve service call outcomes while streamlining the planning process. Filters can be as general or granular as needed. For instance, you might want to apply a filter when service calls originate from a specific country, and ensure that the technicians assigned have the necessary language abilities and/or proximity to best respond. And when service calls originating in Italy were received, you could then apply this filter and assign the service call to an available technician that has the correct position, operates in the relevant territory, and possesses the necessary skills. Note: In order to use this feature, there must be skills associated with technicians, and required skills associated with service calls. 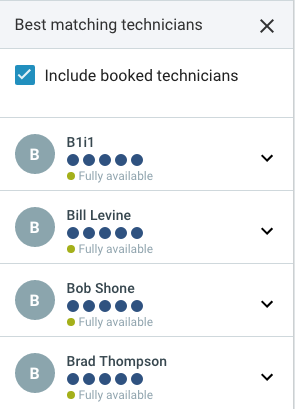 The Best Matching Technicians feature allows you to see which technicians are best suited for a service call, as well as provides prompts when service calls with specified requirements are assigned to technicians with missing skills. From the Service Call List right-click on the service call for which you would like to view the best-matching technicians. Include Booked Technicians Checkbox. This option allows you to query for both available and booked technicians in order to find the best technician. Name The name of the technician. Availability The current availability of the technician. Rating The rating reflects the suitability of the technician for the service call based on the ratio of matching and missing skills. Missing Skills Any/all skills that are missing from the technician but recorded as “required skills” when the service call was created. Matching Skills Any/all skills that the technician possesses that were were recorded as “required skills” when the service call was created. If you want to proceed with the service call, select the Plan Anyway option. If you want to assign the service call to another technician, select the Discard option. 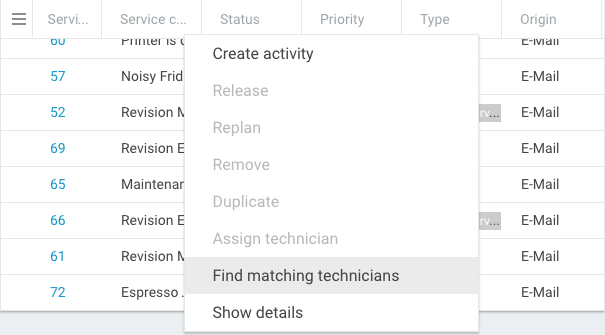 When complete, you can release the service call to the selected technician by clicking the Release Assignments button. Tag This is used for tagging/associating skills with technicians. 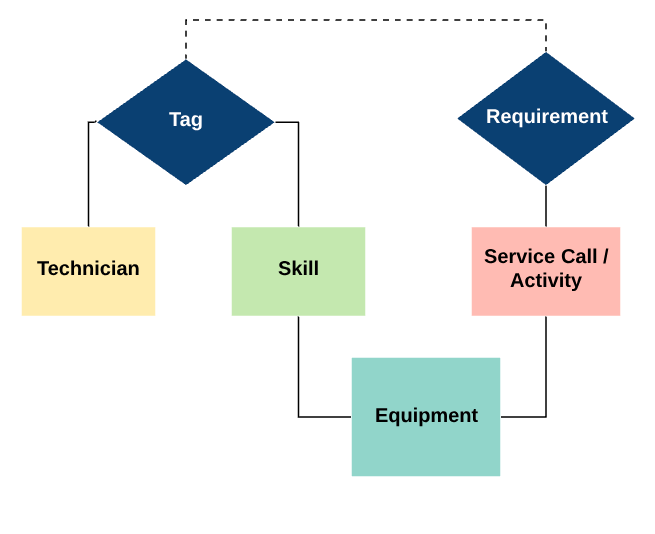 When, for example, a service call and/or activity has requirements associated with it, only a technician who has been tagged with corresponding skills could be assigned. Requirement This is used to associate requirements with a service call/activity. The service call/activity could then only be completed by a technician who has been tagged with the corresponding skills. 1 A tag forms an association between a technician and a skill. 2 A requirement forms an association between a service call and/or activity and a required skill. 3 Equipment can be associated with both skills and service calls / activities.